Firstly Dad visited today to show me progress on a few things. An FR gunpowder wagon (mercian kit) has been painted matt black. Why you ask? Well it was easy and ready for painting so it was painted! Dad also brought the Pullman obs so I could mark the window positions and then build the interior. This I have done and it will be sprayed grey tomorrow. Dad has also made progress on Castell Caernarfon (black chassis, off white roof, red buffer beams etc) and some other bits. On Tuesday he has promised a Garratt week to get on top of the NGG16s! In my paint shop, I’ve painted van 2 with the red ends and details whilst also replacing some glazing, adding people inside, removing the bars on the windows and reaffixing the roof). As I had the orangey-red colour out, I finished off a FR quarrymans car too. Finally carriage 38 had its ends painted in that red plus one coat of ivory around the windows. I am however not totally happy with the ivory, it either fails to cover or leaves blobs, even when mixed properly and slightly thinned. weird stuff and not like the rest of the excellent humbrol acrylics. I’m looking for some other ivory paints instead as this is a key colour for me. Here’s two of the more unusual items of rolling stock, a heavily modified ex Vale of Rheidol brake to go on the WHHR train with Gelert or Russell… and FR carriage 37 now with people installed, roof on and painted and red/cream done. There are loads of differences between the NGG16s on the WHR, but some are just going too hard to replicate such as the rear side of the water tank next to the smokebox, which has a totally different design to the later NGG16s. However I am going to try my best to replicate the real thing within the boundaries of time until expong, cost and ease of installation. - Cab roof, and shorter cab with no rear window. but I will use the castings in the kit for most of the injector/ejector gubbins as there is now not really time to get them imported from the US. I think that’s a good compromise. 360: a mid green maybe for Upnor? Purchased on ebay late last night is this Paul Windle scratchbuilt model of Gelert, running on the WHHR. This is a special engine for me as I have driven it(!) 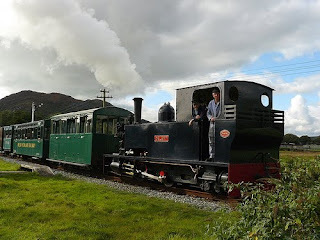 and thus although it looks very unlikely that Gelert would ever make it to Rhyd Ddu, I don't mind running it behind my models of the buffet car, 25 and the ex Vale of Rheidol van. It's built on a Bachmann 0-6-0 chassis, modified to an outside framed 0-4-2. The plastic has discoloured a little, as it has been left unpainted for a couple of years, but this should be no problem. One other benefit for me is that the livery is very simple - very dark blue, no lining and matt black smokebox. easy! Finally it’s done. The flash makes the colours stand out too much, they are flatter than this, but you get the picture. Last night I glued all the bogie pivots into place on the relevant carriages, some 16 of them. I then started work on Pullman 2115, before realising that the bogie pivots were at least 5mm away from centre, I suspect because the pilot holes etched on the 'kit' were incorrect. So the interior had to be removed, the captive nuts unsoldered and cleaned up, new holes drilled, new nuts added, the interior replaced and the bogie pivots installed. 30mins to put that right! I've also painted one of the seats with tamiya green-yellow which frankly is gold, not greeny at all. Once this is dry I'm going to try dotting on blue bits to try and represent the gold and blue moquette in the Pullman. I've also been experimenting with methods of fixing bemos and bachmann bemo copies to bogies. More on that soon. 36 x old 3mm wheels, drilled out with 10BA screws and washers inserted. These are ready for installation. I am going to superglue the bottom of the wheel and then screw them in, keeping them square whilst the glue sets. 1 carriage was done this way as a test. All FR/WHR carriages have now had their ends painted black and the red tidies up ready for ivory spot painting. Interiors have been built, painted and installed for 1000 and 101. The people in car 1000 were chosen in shades of grey, blue and black to look more like workmen (although I suppose hi vis colours would be even better!). The workmens car has also had an interior built and has been painted into a better shade of green. In the garage, the 9 bases for the new legs were installed (screwed) onto 9mm ply and that ply cut into shaped pieces ready for installation. I also installed hinges on one of the 3ft board covers as a test to see whether the design works. The rest of today was taken up with installing a new bathroom door. I have however been wondering how to model the steel handrails on the WHR saloons as soldering steel is proper difficult. I have decided to buy some nickel silver wire and solder it to brass handrail knobs, touching up the later with silver paint to obscure the brass if necessary (although the solder may also help here, being silver coloured too!). Above are the bespoke (yes I know they’re not prototypical, but they’re close) interiors for cars 16 and 20. Below is car 101 to show a painted car up close. The buffet car interior had some details (tea urn, bucket, waiter etc) added too. I don’t have time to model the interior of 2010 the service car as it is unbelievable complicated (kitchen, loo, guard’s area etc) and so the interior was painted black to better hide that their will be no interior. Upnor has also had some details added – spot the differences! and emailed fox transfers about transfers for the Pullmans, the yellow stripe on Castell Caernarfon and lining for Merddin and Taliesin. Still needs extra detailing but is 80% of the way there. - woodwork – new breakfast bar style legs need installing and new board covers need building. - pointwork – test tortoise. - backscene – order mirror vinyl for ends, check backscene test print, if ok get printed on vinyl and install. - electrics –reconnect up a few feeds to new improved bus, carry through bus to hidden sidings. connect up feeds to hidden sidings storage area. - hidden sidings board alignment – do magnets work? - Curtain around layout base – add velcro on layout. - scenics – tart up board joins, add signs and details. Extra trees to hide any backscene issues. - wagons – painting plus couplings etc. Some extra work e.g. handrails to Rob’s excellent ballast and DZ wagons. - check van size as my calculations reckon we will need a LWB transit. 2) 138 – pretty much ready, body needs detailing. Luckily very little of what Dad had done so far has changed after the engine’s overhaul. 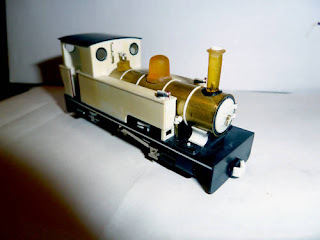 3) 87 – the problem with the chassis has been found – the builder (I bought this half done off ebay) had incorrectly positioned the radius link and the bits of the valve gear that link to it. This is the same on all 4 sides of the valve gear. However now this is known, we should be able to sort this out. The body which I built is back with me for detailing. 4) K1 – I built the body and have nearly finished it. Dad is to tackle the chassis, which are not as involved as the NGG16s and the basic structure is already done (cylinders made up, wheels on axles etc) Only issue on the body will be the coal bars which may have to be made out of brass strip or even etched for us, they are prominent on the loco, but not in the kit. 5) Castell Caernarfon – in body colour now, need to source yellow stripe transfers. This will be a DCC sound loco, so some work required once painted. Also needs lights installed (these may not work for expong). 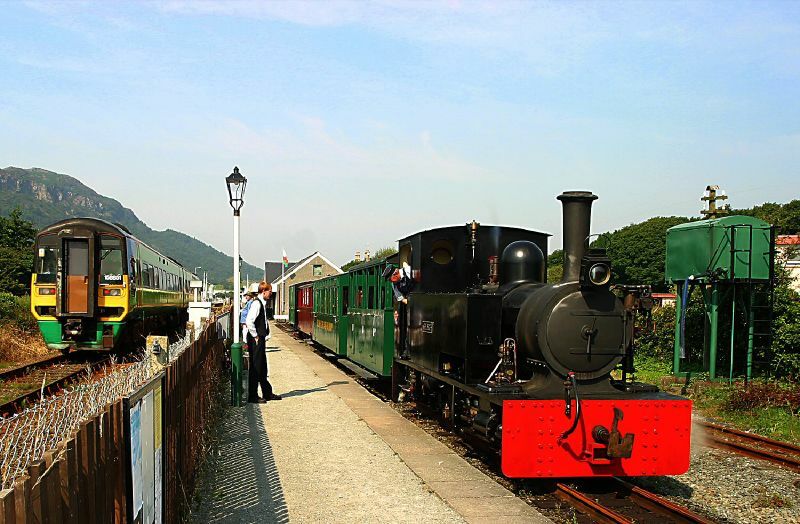 6) Vale of Ffestiniog – basically just needs painting now in it two tone green livery. 7) Merddin Emrys – needs pickups adding and lining, plus decoder. Should be easy. 7) Russell – with Dad to finish electrifying and then ready to paint. 8) Upnor Castle – in need of extra details. May just be a static exhibit at expong like dolgarrog due to some issues in where to put decoder and insulating chassis from body. 9) Taliesin – built by me and nearly ready, at bottom of list though due to pressing priorities above. Conwy Castle/Beddgelert are to be left out of the expong list as we try to get 9 (8 + spare) locos ready and concentrate on the key ones. HECK THERE’S A LOT TO DO!!!!!!!!!!!!!!!!!!!! FR carriages 16 and 20 had their chassis painted by Dad prior to the day in red oxide, black on the railings. The bodies were also in grey primer. I sprayed the bodies green using a mix of mostly malachite green with a little Brunswick. This has worked well. The ends were sprayed red oxide too. However on some of the carriages the red did seep under the masking tape, so a program of using thinner to remove will have to be enacted. - Paint ends black, paint roofs where required. - other finer detail such as electric boxes etc cannot be accomplished for expong but will be added later. - 2 NWNGR summer cars, pickering brake and NWNGR No.1 brake into crimson lake. Upnor had roof rain strips added and was cleaned up. It just needs a few extra details now and then is ready for primer. Castell Caernarfon was cleaned up, primed in red oxide and sprayed with 3 coats of enamel BR crimson (railmatch), it may need a couple more coats too as that stuff is thin! Vale of Ffestiniog had a lot of attention with front handrails and lamp bracket added, steps attached as firmly as we could and the new holes in the roof squared off. It was then primed grey. Other progress : Mum has kindly finished the curtains for the base of the layout (thanks!) and added the velcro. job done. Where possible (i.e. not more than one loco exists for a single number) the address should be the actual number the loco carries. However in some cases e.g. 1 which could be Russell, Princess or K1, compromise is required. Each address must be unique and 3 is right out as that is the default address for all decoders on delivery. Where no number is known a sensible maximum two digit code should be used for ease of use. Note some of these engines listed below I have not got a model of, but the numbers are assigned here for future proofing. 13-19 spare for either new built engines or visitors like the Darjeeling B class, Velinheli etc. The 9 adjustable legs arrived today and I have set out the cuts required to my spare piece of 9mm ply to act as bases for them. I also cut out 8 x 250mm pillars which were then glued onto the new board (initially using hot glue, but later grab adhesive when the hot glue ran out) and will support the roof of this hidden section, taking nails from above. This should mean that the lid is sufficiently strong to take some displays – perhaps my digital photo frame on slideshow mode showing images of the layout in progress? Finally a batch of 128 No.4 x 9mm screws were ordered for the new hinges. Here the tortoise has been installed with 4 No.4 screws, it awaits testing though. In the garage last night I finished off the board that is really just a table and added the DCC bus to the Ffridd board having cut out all the unnecessary wiring. The soldering iron is required in the garage before I can move forward there (and I don’t fancy that in the rain!). The 28 hinges I ordered have arrived, ready for the construction of the board protection ‘covers’ mentioned yesterday. There is also DZ wagon progress here: http://bostonlargsworks.blogspot.com/ Looking qualitteee! I’ve been giving the transport and protection of my scenic boards some thought and have devised a relatively simple way of avoiding them from being knocked in storage/transit. The front side (punters side) of the layout already has velcro attached ready for curtains. So it’s easy to add a velcro-ed panel which with hinges can then bend 90 degrees over the top of the board covering the scenics. I intend to add some small brackets at the top end to clip over the backscene keeping it all in place. Given teh boards are always carried upright, it won’t be a problem that these would fall away when held upside down! The sides are then added in the same way, hinging off the top. However I can’t have velcro here (if I did the boards wouldn’t abut up to each other during use) so something to tie the corners together is necessary – perhaps two smal knobs and elastic bands to hold the corners? The plywood (6mm) is in stock and I got the nice bloke at B+Q to cut the pieces for me using their bandsaw so I’m halfway there already! Here’s the underside of the station approach board. The DCC power bus has been extended to run onto the Ffridd Isaf board (the coil of wire on the table)and then to the hidden sidings via the new board (which already has it’s bus in place). Previously power to the Ffridd board had been passed across via a separate connection (using an old PC serial connector), but now that the run has been extended, it makes sense to minimise voltage drop concerns by extending the power bus to the new board too. Also the plug in tortoise socket has been soldered up ready and the necessary rectifying diodes (1N4001s) added. I have no way of knowing from the tortoise instructions which way around the switches are wired, so it’s 50:50 that the frog polarity and LED for the point indicator are correctly wired! Pilot holes for the tortoise have also been drilled. 1. Solder a length of straight wire (approx 4mm gauge) through the holes in the etched (worsley) balcony rail. There were 8 of these wires on the 2 coaches. - they needed to be 3mm from the top edge and at 7.5mm centres. 4. Solder the wires into the holes and also to the end plates. 5. Whilst holding the balcony rail with pliers next to where it joins the support wires, carefully bend the rail to the required curve and solder it's end to the outer edges of the end plates. 6. It is possible to adjust the assembly by using a soldering iron on the top join of the support wires and carefully moving the rail up or down the wire as necessary. Bored in a hotel in Wetherby last night, I took along some acrylic paint, superglue and my box of seated people. These are the first test interiors. Only some of my seated people fitted and others will have to have surgery to their feet to get them in, but I am generally very happy with the result. A nice mix of colours in clothing was possible too. On one coach the resin cast seats had been added after the black chassis colour had been sprayed on, so I painted straight onto the yellowy resin and it’s fair to say there is a colour difference, despite two coats! However I am really happy with the darker red on the other interiors (on top of grey primer). This same red will be used for carriage sides, but on top of ivory it will be different again (hopefully just right). Oh and I really can’t be bothered with tables at the moment, sorry! (I may add them later but not for expong). K1 - needs engine units building and painting, lining may have to wait. Beddgelert - needs rods but chassis ready and body even painted. Upnor Castle - lots of work to do especially to mount chassis to the body and to detail. Risk as real engine is in works at present and may come out differently - already talk of new headlights for example. Taliesin - other engines will take priority despite the fact it is well on. Chassis works but is not perfectly square and this concerns me. David Lloyd George and Lyd - still kits! The hot weather has meant progress is concentrated outside. Thomas and I thus laid the track on the new board, ensuring that the minimum radius was 12 inch and no less! The track sits on woodland scenics 'roadbed' which apparently does a better job than cork in sound deadening. We shall see. On the underside I drilled holes through the struts and added the new bus bars (14 awg multi strand wire). Behind this sits the final 'storage' board and you may note that one of its struts is rather different - this is because I ran out of 2 by 1, but had this square piece in the garage already so decided just to use that for now. The hidden sidings have come on well too, and here are shots of the two. Pieces of stripwood have been added to the storage area on the right to avoid stock falling to be floor in error. In addition I have large pieces of hardboard to pin underneath too. The necessary track has been cut to length but I need some more copper clad sleepers before I can complete these (I am hopeful that Dad might have some when I visit next week?). It seems there is room to accommodate the new peco point, so the old one is out and the new one has been altered by removing the wires bridging the gaps and bonding the stock and closure rails together. The hole for the point motor needs to be closer to Waunfawr though so I need to drill that out before the point can be installed. The two key boards (station and yard) have been aligned using wixroyd catches. These are excellent. There remains a little work to do to finally align the rails but they are not far of at all. I then rescued the other board from the garage, where the spiders have been busy! and immediately we run into an interesting decision… here the new peco point is shown on top of the old one. The length and angle are (as noted in a previous post) very different, but the new peco point is far easier to make DCC friendly and in doing so allows me to keep the over-centre spring, helping the throw with point motors. I need to consider whether the shallower angle is compatible with the station board, which it seems will have to have its track slewed over slightly near the board join. Have had their tanks fixed on and water feed pipes added. All they need now is the strapping, but I need to work on other things at present so I’ll be moving this board out of the study so I can sort out the point on the station access board and also prepare some locos for painting. Here’s the new board (although it now has another piece of the backscene added and two pillars). The green underside is due to the fact that the board was once used to hold a brio railway for Thomas. Recycling! 200 extra seated people also arrived yesterday (OO scale of course) and were sorted into colours. I have already made up 8 trestles. Making more would be a bind and time consuming, thus I was playing around on the way back from London yesterday with the idea of using adjustable breakfast bar legs (like the ones I’ve just installed in our new kitchen) to hold up certain parts of the layout. You can get them adjustable to about 920mm which is just about perfect. They come with a base plate (with 7 screw holes) and then a small grub screw holds the leg to the base plate via a clever tightening mechanism. They are sturdy, easy to take up and down and avoid the ‘trip hazard’ that the trestles might be. So, how many do I need? Well it makes sense to replace the two current sub-prime legs (wooden held on by two wing nuts on bolts) with these legs and for the new board to have two legs to hold up the section that juts out. Then to avoid the trip hazard problem, I could probably do with two at the ends of each of the hidden sidings. Thinking a little bit further and I found that adding one more leg to that total would allow me to erect the other 4ft x 2ft board that I’ve already made up as a kind of modelling table where tools etc (and cups of tea) could be kept. Taking that to the final thought, why not (not for expong) have a lifting 2 foot by 2 foot section to complete the circuit, allowing easy access to the centre of the layout for operations purposes. cool eh"? So these legs are £23 each in B and Q (ouch!). But on the modellers’ friend (ebay) I got 9 legs for £80 inc P+P (yes I’ll have to sell a few things to pay for it, but what a saving over the £207 B and Q wanted!). The above image shows black blobs where the legs will go. The 8 trestles are also fully utilised. Today I planed the side adjoining the public viewing area and added a backscene piece to the new board. I also added two pillars to support the final backscene piece. However this piece is 738mm long and I didn't have any 6mm ply left so a trip to focus diy is required. I also bought some woodland scenics roadbed (apparently better than cork at sound deadening) and 14awg wire for the extra power bus I require. I have taken photos and will post them soon. The new board has progressed with the back side cut to shape and planed square. Then a 4 foot piece of backscene ply was nailed on to complete that side. On the other side a frame was constructed for the extra section overhanging the usual 2 foot width. I now need some more 5mm ply to add the other sides and also some woodland scenics roadbed before I start thinking about legs. All the track I need is in stock already. and the first of the wixroyd catches installed (as suggested by JdF of county gate). Now the other hidden sidings has to feed the Ffridd Isaf end via a small aperture 2 and a bit inches from the edge (sorry about the shocking carpet – it lines the garage!). Here’s that hidden sidings board. Except that I noticed (it took me a while!) that the board in its current state would only allow one of the traverser roads to feed the layout! ah. Really the feed needs to be central to the hidden sidings board (where the pencil mark is below). The problem there would be that a good foot of the Ffridd Isaf board would then not be visible. So I had a good think and have decided to add a board (!) which will swing the line back 180 degrees and feed the hidden sidings in the middle. Luckily I had already created two four feet boards for another project so the top was taken off, sawn in half and reattached. Then another piece of 9mm ply hanging around the garage was cut to overlap the edges (the 180 degree turn more than 2 feet width to swing around). A small gap between the two was filled with polyfilla (and will be sanded) and then I used my 12 and 15 inch radius tracksettas to mark out the new line. As it happens the overhang on the other side is not required and can be cut off. I will also now need an extra trestle and 2 extra legs(!). However out of all this, there is some benefit, which is that the layout is now not as long. It would have been 16 feet long and is now 14 feet but will be slightly wider by 150mm.